This beautiful, versatile device is poised to be the most popular phone of 2016. We’re highlighting the top four features that make this phone extra special. Samsung’s had a built-in stylus for the Note phones for a while now, but the one that comes with the Note7 is better than ever. It has a click-top, exactly like you’ll find in an ink pen, which helps you remove the stylus from its holder in the phone. When you take it out, the phone immediately switches into a mode where you can draw or write on the screen, whether the phone is unlocked or not. The pen can also take screenshots, create GIFs from videos playing on the screen, and magnify tiny text so you can read it. Nothing’s more futuristic than using your eyes to unlock something, and you can do just that with the Note7’s built-in iris scanner. It maps your iris’s unique combination of colors to verify your identity and it works faster than swiping your finger on a fingerprint scanner. We’ve tested it out here at Speck and it works lightning-fast. For now it’s only for unlocking your phone, but you could eventually scan your irises to enter a password or verify a purchase. Like previous Samsung Galaxy phones before it, the Note7 can withstand a dunk in the pool or a splash of water from the sink. Just don’t take it diving. Specifically, the Note7 is water-resistant in up to 5 feet of water for 30 minutes. Samsung’s become a pioneer of curved screens, giving us phones that look like they disappear around the edges. The Note7 has these same curved edges that make the phone look awesome and make it easy to hold. The curved screen isn’t all just good looks though. Swipe from the edge of the curve, and you’ll bring up a menu with app shortcuts, speed dials for your favorite contacts, and at-a-glance information on the weather and sports scores. Ready to get your hands on the Note 7? You can pick one up starting August 16. 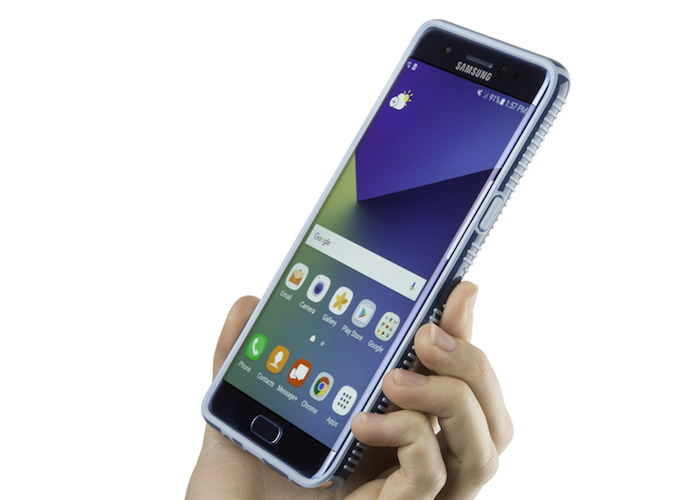 Make sure you protect this awesome phone with Speck’s CandyShell Clear, Clear with Glitter, and Grip Note7 cases. They’re available now on speckproducts.com.